25 year old Lukas Yla knew that an ordinary resume wasn’t going to make the cut in a hyper-competitive Silicon Valley job market. So, he decided to take his job hunt game a notch higher with a creative, if oddball, approach. Lukas, a marketing graduate who’d moved to San Francisco from Lithuania on a job hunt, shortlisted a bunch of companies he wanted to apply at, and has devised a way to reach them directly. 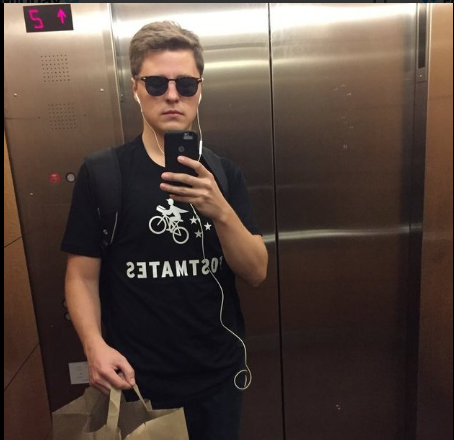 He dresses up as the delivery company Postmate’s delivery man and hand delivers doughnuts at various companies. The doughnut box opens to deliciousness but also to Yla’s well crafted résumé inside. To prepare for the disguise, he printed a Tshirt like a Postmate’s delivery man and printed a bunch of doughnut boxes and printouts to stick on the doughnuts boxes. To make sure that the prospective employers could look him up online if he managed to pique their interest, he also included a bit.ly shortened link to his Linkedin profile. There have been several people who have tried innovative approaches to making their resumes stand out. Be it Nina Mufleh’s AirBnB resume, Sumukh Mehta’s GQ styled GQ Resume, or closer home a Flipkart-style resume, Lukas’s unique approach stands out because it takes the whole process offline, and aims at building a personal connection with the employer. 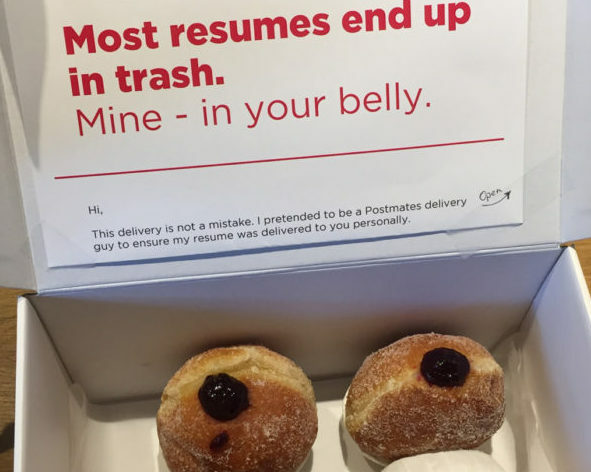 We will be watching out for where the box of doughnuts takes this creative marketing job seeker.